Want to sign up for Verizon Prepaid Wireless and use your current iPhone? Well you can, and this article I’ll explain what you need to know and show you how. 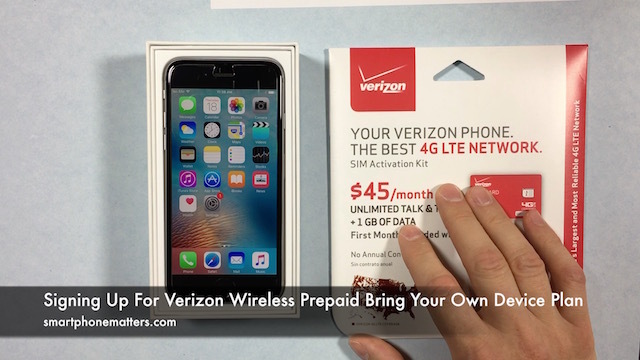 Verizon offers its own prepaid wireless service and if you already have an iPhone, Samsung Galaxy S model, or other smartphone, you may be able to use it with Verizon’s Bring Your Own Device Plan. With a Verizon Wireless prepaid BYOD plan you’ll prepay for your service each month, but you’ll have no expensive contracts or payment plans. Most of you are anxious to know if you can use your current iPhone? To find out if your iPhone can be activated with Verizon, you can check online at verizonwireless.com. You’ll need to enter your phone’s serial number called the IMEI. To find your phone’s IMEI, dial *#06#. Most Verizon iPhone 5, iPhone 5c, iPhone 5s, iPhone 6 and iPhone 6s models are eligible as long as the phone was not reported lost or stolen, any contract of payment plan for the iPhone has been paid off, and the account iPhone was from was left in good standing. Recently Verizon made some changes to their policies and iPhone models from AT&T, T-Mobile and Sprint may also be eligible. To find out if you can use your iPhone, check on verizonwireless.com. If you have a Samsung Galaxy or other Android phone, you check to see if it is compatible the same way. To view plan details, visit verizonwireless.com. Verizon Prepaid offers $30, $45, and $60 plans. All Verizon plans include unlimited talk and text inside of the US. All plans also include unlimited text to Canada and Mexico as well. The $60 plan also includes Unlimited Talk to Mexico and Canada. The $30 plan does not include any cellular data so you’ll have to rely on your own WiFi. The $45 dollar plan includes 2 GB of high speed data. The $60 plan includes $5GB of high speed data. If you enroll in their AutoPay program, which automatically refills your account from your credit card, you’ll get an extra 1 GB of high speed data per month. Once you use up your high speed data, the Always-On data feature will provide a reduced speed data connection. You’ll be able to use data for basic functions, but streaming audio and video may not work well at the slower 128Kbps data speeds. Verizon prepaid also offers Add On Data. If you use up all your high speed data, you can purchase more. With Add On Data you can purchase an additional 500MB of high speed data for $5, 1GB for $10, and 3GB for $20. The $5 Add On Data is good for 30 days after you activate it. The $10 and $20 Add On Data package is good for 90 days. Verizon Prepaid also supports Mobile Hotspot so you can share your data connection with your computer, tablet, or other devices. Once you have checked to make sure that your iPhone is compatible. It’s time to order a SIM activation kit. When I ordered mine, Verizon was offering a 50% discount online with free two day FedEx shipping. You can order yours by following the steps below. Click here to otder your Prepaid SIM KIT – Get a 4G LTE SIM Activation Kit including the first month of service & unlimited talk & text. The included SIM is a nano SIM. The kit includes two adapters in case your phone needs a micro SIM or full size SIM. All iPhone 5 and 6 models that use SIM cards nano SIM. As I mention in the video, I somehow managed to complete my activation without knowing it. I got an error message to call customer support. Once I did they told me my SIM card was active and when I put the SIM in my iPHone 6 my phone worked. Once I put the SIM in my iPhone, I had service. I checked to make sure that I could make and receive phone calls and that voicemail worked. My iPhone has Visual Voicemail. After checking voice, I checked that I could send and receive SMS text messages, which both worked. I then checked to make sure that I could send and receive MMS picture messages. Finally, I used the Safari to make sure I could access the Internet. I measured my data speeds using the SpeedTest app, and in some areas I saw 30Mbps down, which is fast. So far I am impressed with Verizon Prepaid. You get less high speed data for your money, but the data is fast and you can buy more when you need it and it’s fast. I had a problem with the activation, but a call to support cleared it up.